It’s not easy finding the perfect balance as a manager. You want to be the “nice guy”, the great boss that cares about their employees’ happiness, health, work-life balance, etc. But you also need to make sure that the team is functioning at 100 percent, and sometimes this requires giving negative and constructive feedback. 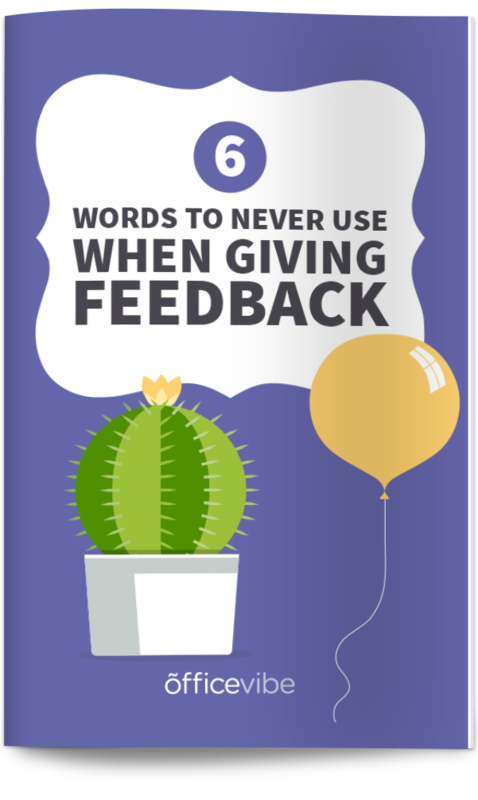 Download this list of 6 negative words to never use when giving feedback to your employees. Why is it hard for us to give negative feedback? It’s hard for managers to give negative feedback, because human to human, despite our titles and roles, it’s not easy to point out someone’s shortcomings so openly. It’s awkward, but luckily there are ways to get more comfortable with the process. We’re worried about the other person’s reaction: What if she gets angry? What if he cries? What if she tells me I’m an idiot? What if he gets super defensive and starts blaming me? Another important tip to remember is that employees ultimately hope to improve and grow, so they want your feedback, good and bad. You just have to keep in mind not only what you are saying, but how you choose to say it. The way the feedback session goes does not only depend on the relationship you have with your employee. If you have developed a transparent, trust-based relationship with your team, then they will know that you have their best interests at heart and that the feedback, be it good or bad, is for their own betterment. If your best friend tells you that your new haircut doesn’t suit you well, you (hopefully) won’t get mad, because you know that their criticism is coming from a good place – to help you be the best version of you. On the other hand, if a non-friend, an acquaintance or a stranger came up to you and gave the same criticism, it would be understandable that you would take the news badly. When mutual trust and appreciation exists, the feedback will be received more openly. Not only does this behaviour-oriented approach not attack the personality of your employee, but it also shows them that you are there to help with the issue. Furthermore, it ends with a question soliciting their opinion and feedback so you can be sure that they are comfortable. And lastly, emphasizing a solution while presenting the problem is really important. It takes away from the direness of the issue at hand and injects some positivity into the mix so you can motivate instead of de-motivate your team. Make it about their behaviour, not who they are. Let them know you are there to help. Along with stating the problem, offer a solution. I’m not a huge fan of the compliment sandwich because I think employees expect this method, which feels forced. So they end up just focusing on the meat – the problem stuck between the middle of two bland, empty compliments. This won’t cut it. Employees need and deserve sincere recognition for the great work that they do. Be specific with your praise. It’s so easy for your employees to see and feel when you’re being real. Talk to them about the things they are doing well, what specifically you found impressive in their work, etc. When employees feel that they are being seen as much for their positive contribution as well as their shortcomings, they will be more willing to improve in order to keep receiving that positive reinforcement. Without it, there is not much to look forward to. Great leaders possess empathy, enough so that they would put themselves in a similar position of vulnerability. This is why it’s important to ask your employees for their feedback on your performance. Granted, it won’t always easy for employees to give their manager constructive criticism or negative feedback but offering them the option to do so offers the suggestion that no one is perfect, we all need work, there is room for improvement always for all of us. And isn’t that the truth? Employees generally know when their work isn’t strong and giving them the opportunity to own up to it and offer insights into their own mistakes is a way to make the negative feedback less condescending. Let it come from them, then respectfully agree and guide them with solutions. How do you feel about giving negative feedback? We’d love to hear your experiences, tips, and tricks!